Today at the Dayton Hamvention, SDRplay Limited is announcing the launch of a new Software Defined Radio product – the RSPduo. The RSPduo is a radical new addition to the RSP line of SDR receivers from SDRplay. Architecturally, it is different from any previous RSP in that it features dual independent tuners, both piped through a single high-speed USB 2.0 interface. The SDRplay RSPduo is a dual-tuner wideband full featured 14-bit SDR which covers the entire RF spectrum from 1kHz to 2GHz giving 10MHz of spectrum visibility. Initially using Windows based ‘SDRuno’ supplied by SDRplay, you can simultaneously monitor two completely separate 2MHz bands of spectrum anywhere between 1kHz and 2GHz. Superficially the RSPduo looks identical to the highly popular RSP2pro and will be able to operate in a very similar way. huge benefits in terms of improved performance. Due to its exceptional combination of performance and price, the RSP family of receivers have become very popular and the RSPduo provides the next level of functionality for both amateur radio enthusiasts as well as the scientific, educational and industrial SDR community. The RSPduo is expected to retail at approximately $279 USD (excluding taxes) or £199 GBP (excluding taxes). This entry was posted in AM, Longwave, Manufacturers, Mediumwave, New Products, News, Scanners, Shortwave Radio, Software Defined Radio and tagged hamvention, Jon Hudson, New Products, Product Announcements, SDR, SDRplay, SDRplay RSPduo, Software Defined Radio on May 18, 2018 by Thomas. This morning, SDRplay Limited announced the release––and availability––of their second generation software defined radio, the RSP2. Regular SWLing Post readers will note that I’m a pretty big fan of SDRplay’s first SDR, the RSP, or “RSP1,” as I’ll now call it (I published a review of the RSP1 in July 2015). To me, the $129 RSP1 has been the best wideband receiver you can buy under $200 US. Its HF performance, in particular, is sincerely impressive at this price point. So what’s the RSP2, and how does it differ from the original RSP? In a sense, the RSP2 gives the enthusiast and experimenter access to more receiver parameters and control, opening it to a wider array of possible applications. The RSP2 will also cover a broader range, from as low as 1 kHz to as high as to 2 GHz, and is designed with better selectivity across the spectrum. Enhanced selectivity will certainly benefit amateur radio operators and SWL DXers who might seek weak signals in crowded portions of the band. 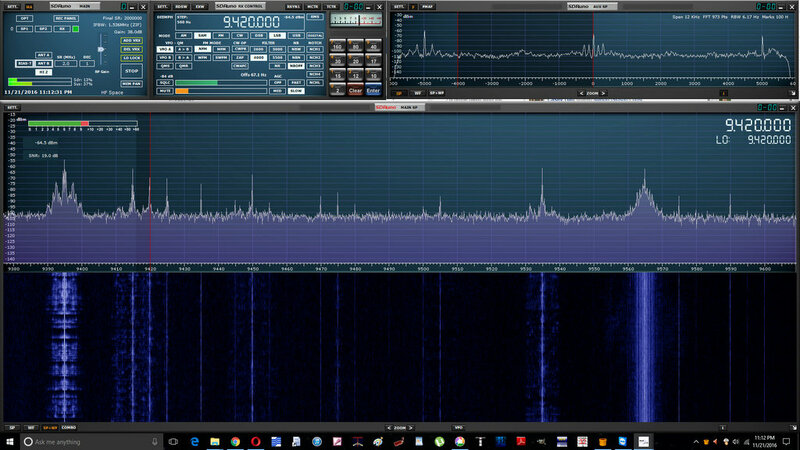 For the moment, the RSP2 only works with SDRplay’s own application, SDRuno. But SDRplay is already working with developers to make the RSP2 compatible with HDSDR, Gnu Radio, CubicSDR, and SDR Console. I appreciate that although the RSP series has an excellent free proprietary application (SDRuno), it was nonetheless developed with many open-source applications, also free, as well. This level of compatibility and support makes SDRplay rather unique among SDR manufacturers. SDRuno running the RSP2 (click to enlarge). Of course, SDRuno is a great application in its own right, and pairing it with the RSP2 will provide you with out-of-the-box calibrated RF and S meters. So far I’m very pleased with native SDRuno features like virtual receivers, embedded time code, spectrum display options, and streamlined design. Current SDRuno users will note the different antenna and filter options with the RSP2 which works natively with the latest versions of SDRuno (click to enlarge). SDRuno installs very easily and provides a plug-and-play experience. It does have a modest learning curve, but SDRplay has an excellent owner’s manual and “cookbook” available to help you set everything up the first time. SDRplay sent me a pre-release RSP2 (the base model, not the metal box “Pro” version) to evaluate and provide the company with feedback. I installed SDRuno and put it on the air only this past week. In truth, as I’ve been traveling and must be on the road again this coming week, I prefer not to comment, at least in depth, on the SDRplay’s performance as I’ve had comparatively little dedicated time with the unit. Yet I have had the RSP2 on the air a few hours of casual listening, and find that it performs as I would expect: low noise characteristics and sensitivity that seems to be at least as good as the RSP1, if not a bit better. I’m looking forward to a side-by-side with the RSP1 running an install of SDRuno on my laptop! I must say that I’m very pleased with the RSP2’s Mediumwave/FM notch filter. It happens that a local daytime 45kW AM broadcaster in our area is having transmitter issues which send wideband spurs across the entire HF spectrum; but at night, when the station lowers its power levels, the RSP2’s MW notch filter effectively mitigates the noisy signal. I imagine this filter will be a welcome addition for listeners living in RF-dense environments. When the RSP1 was first introduced, it retailed for $149. As the economies of scale worked in their favor, SDRplay lowered the price to $129. The new RSP2, meanwhile, is expected to retail at approximately £130 (excluding taxes), or $169 US (excluding taxes). Quite a value, in my opinion: at $169, you’re getting a lot of SDR for the price––and an effective SDR application, to boot. But if you already own an RSP1, I wouldn’t necessarily rush out and grab the RSP2 just yet. Of course, if you like the added features mentioned above, or if you’d like an inexpensive SDR with no less than three switchable antenna ports and a MW/FM notch filter, $169 is a bargain and about the same level of investment as a good modern shortwave portable. As for myself, I’m happy to see a mom-and-pop community-supported company like SDRplay continuing to innovate for our hobby. I’m pleased to support them, and am truly appreciative that they also support our SWLing Post. This is a win-win, in my view; I’d be pleased to support more such companies. Again, check back here as I plan to compare the RSP2 with the RSP1 and several of my other SDRs. Click here to read SDRplay’s full announcement and press release. I plan to take the RSP2 with me on my travels this week. Time permitting, I might even pair it with my recently acquired PK magnetic loop antenna for some spectrum gathering and testing. In the coming weeks, as my schedule permits, I’ll post updates here on the SWLing Post, including audio comparisons with some of my SDRs. If interested, bookmark the tag RSP2. For more information about RSP2 pricing and availability, check out SDRplay.com. Update: Check out RTL-SDR.com’s assessment of the RSP2. This entry was posted in Ham Radio, New Products, News, Radios, Shortwave Radio, Software Defined Radio and tagged Product Announcements, RSP2, SDR, SDRplay, SDRplay RSP2, SDRs, SDRuno, Software Defines Radios on November 22, 2016 by Thomas. AOR has announced their latest (very) wide band receiver, the AR6000 last month at the 2013 Dayton Hamvention. As with most AOR equipment, the AR6000 comes at a premium price–$6,500 US–but this receiver is quite unique in that it covers most of the radio spectrum 40 kHz to 6 GHz. I imagine AOR sells most of these to commercial and government entities; indeed it’s only available for export or government purchase here within the US. The AR6000 delivers continuous tuning from 40 kilohertz to 6 gigahertz in a wide variety of modes for professional monitoring performance that’s nothing short of amazing in terms of accuracy, sensitivity and speed. Standard modes include AM, FM, WFM, FM Stereo, USB, LSB and CW. An optional module can add the capability to receive APCO25 digital communications plus an optional I/Q output can be added to capture up to one megahertz of bandwidth onto a storage device for later listening or signal analysis. Designed for the monitoring or technical service professional, there are no interruptions in the AR6000’s tuning range. With exceptional tuning accuracy and sensitivity throughout its tuning range, the AR6000 begins at the floor of the radio spectrum and continues up through microwave frequencies so it can be used for land-based or satellite communications. It works as a measuring receiver for those seeking a reliable frequency and signal strength standard. To support its broad spectrum, the AR6000 has two antenna ports, with the added capability of an optional remote antenna selector from the front panel of the receiver. Click here to view the spec sheet and brochure (PDF). This entry was posted in New Products, News, Radios, Shortwave Radio and tagged AOR, AOR AR6000, AOR AR6000 Very Wideband Receiver, AOR USA, AR6000, New Products, Product Announcements on June 15, 2013 by Thomas. 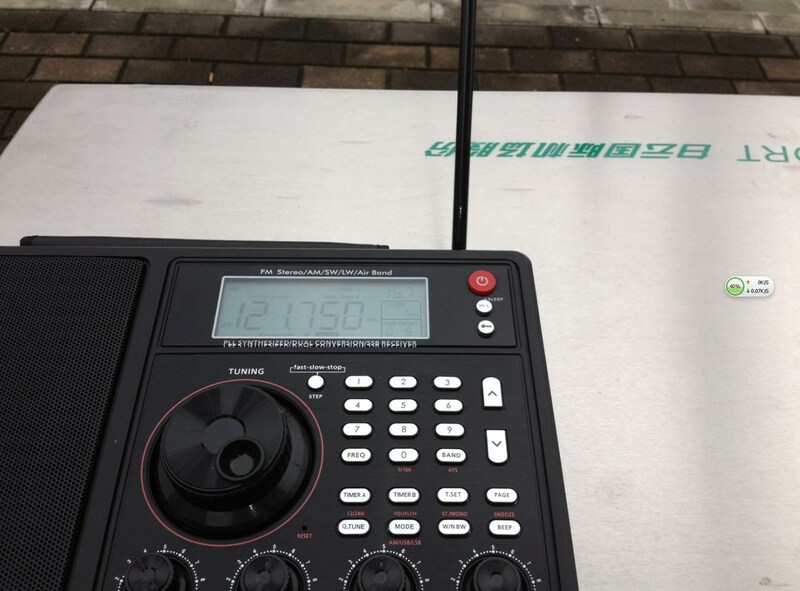 New large portable shortwave radio in the works? It looks like a new, large portable radio — along the lines of the Redsun RP2100 — is on the way. At least this one includes a direct-entry keypad and SSB, like the RP3100 is supposed to. I hope they can do good QC, and keep the sample to sample variation low. Thanks, Gary. It does look like a variation of the of the RP3100. Sounds like it’s not a Redsun product, but may have been ported from one of their engineers for JiDian. It certainly has the trademark look. If this is true, there’s a possibility that C.Crane could bring this to North America. Perhaps it’s the next radio in line to succeed the CCRadio SW? Though a great radio, the CCRadio-SW is getting a little long in the tooth. This entry was posted in News, Radios, Shortwave Radio and tagged New Products, New Shortwave Radios, Product Announcements, Shortwave Radio on April 26, 2013 by Thomas.